The traditional hand twisted and knotted fringe is just one of the many treasures of this deliriously soft authentic Moroccan susti set... IN STOCK and ON SALE NOW! It's twilled, woven and dyed by hand in Morocco, the YUMMIEST cotton/rayon susti (susdi) that's as luxurious as cashmere... if you're already a Tiendaholic, you know what I mean! Click this link to see more details—and measurements!—about this gorgeous Fassi top... and here for more about this s-w-i-n-g-y skirt, the Bab style. 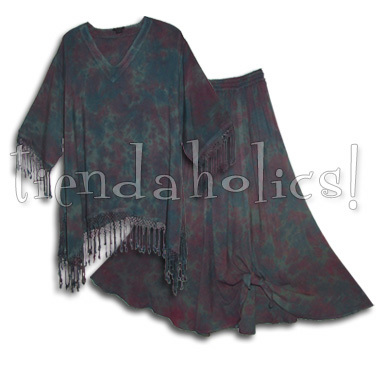 These pieces sell separately for $164!